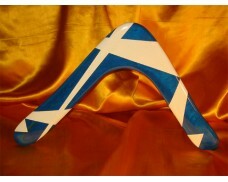 This boomerang has a standard flight pattern, is a high flier and has proven to be very popular. 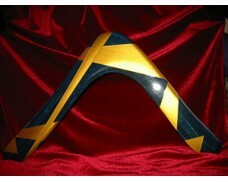 This is one of my larger boomerangs and is a wonderful hoverer. It can be a little harder to catch due to its larger size but its hover tendency makes it a softer return which balances things out, easing the catch. 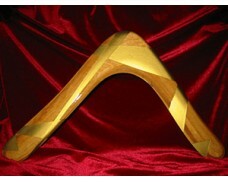 I usually recommend this boomerang for older teens and adults who can handle the larger size. 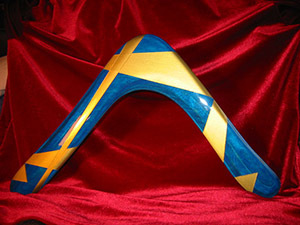 Bandit Crane Boomerang - Lapis Blue and Gold. 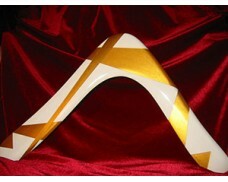 This boomerang has a standard flight pattern, is a hig..
Bandit Crane Boomerang -White and Gold. 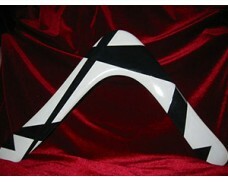 This boomerang has a standard flight pattern, is a high flie..
Bandit Crane Boomerang -White and Black. 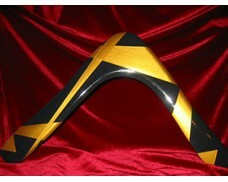 This boomerang has a standard flight pattern, is a hi..
Bandit Crane Boomerang -Black and Gold. This boomerang has a standard flight pattern, is a high..
Bandit Crane Boomerang -Light Brown and Gold. This boomerang has a standard flight pattern, is ..
Bandit Crane Boomerang -Dark Brown and Gold. 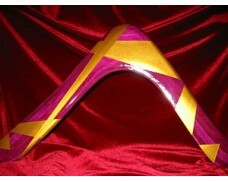 This boomerang has a standard flight pattern, is a..
Bandit Crane Boomerang -Fuschia and Gold. 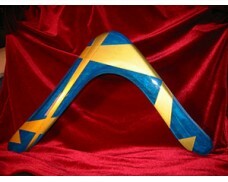 This boomerang has a standard flight pattern, is a hi..
Bandit Crane Boomerang - Indigo Blue and Gold. 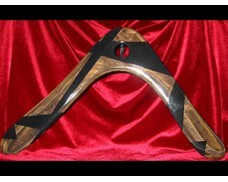 This boomerang has a standard flight pattern, is..
Bandit Crane Boomerang - Dark Brown and Black. 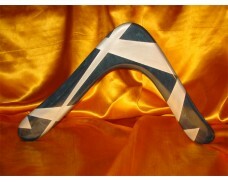 This boomerang has a standard flight pattern, is..
Bandit Crane Boomerang - Lapis Blue and Silver. This boomerang has a standard flight pattern, i..
Bandit Crane Boomerang - Indigo Blue and Silver. This boomerang has a standard flight pattern, ..
Bandit Crane Boomerang - Red and Gold. This boomerang has a standard flight pattern, is a high ..
Bandit Crane Boomerang -Yellow and Gold. 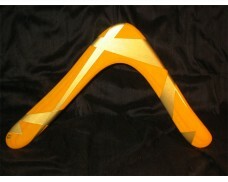 This boomerang has a standard flight pattern, is a high fli..
Bandit Crane Boomerang - Orange and Gold. This boomerang has a standard flight pattern, is a hi..